Few manufacturers in the world have put as much effort into designing a flexible and good value range of multi-bay filters suitable for the Koi pond as Cloverleaf, and how refreshing to not only know that they are British but to acknowledge they offer first class technical support to customers/end users. As can be seen from the general design concept to both the Cloverleaf “CL” and “Genesis” range, key beneficial features are numerous, starting from the principles of up and down flow through the tanks thereby keeping the water in contact with the mediums for as long as possible. Apart from the advantageous separation and settlement of solids in the vortex bay, the generation of an “upflow” and the incorporation of settlement areas (with drain down valves) ensures that the filtration mediums stay cleaner for longer – thus promoting larger colonies of beneficial bacteria, and by default thereby establishing a healthier pond environment. The thoughtful design layout of the vertical transfer ports also provides the highly useful bonus of being able to incorporate air stones. Size 990 x 990 x 760mm high. This 4 Bay unit comprises of a first stage vortex bay, with Bay 2 being fitted with mechanical brushes, Bay 3 acting as a main biological bay with its Japanese Matting, and Bay 4 serving as the secondary and final biological/mechanical stage - incorporating foam and the highly proclaimed aqua rock/alfagrog. Note:- Pipe inlet size 110mm (4") - Outlet 82mm (3"). 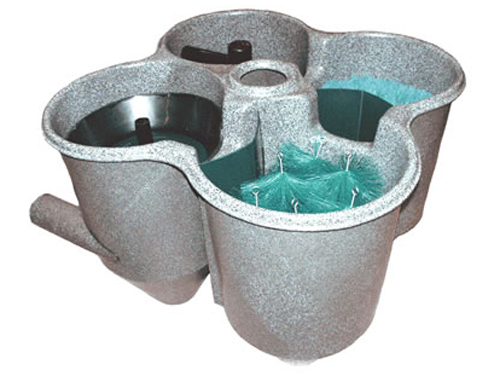 Supplied complete with heavy duty lid, together with waste valves and pipes.